Here's an easy antenna project that you'll have fun building and will enjoy using for many years. The Peg Leg Antenna is a rugged and sturdy half-wave vertical dipole antenna that if built as shown can handle all the power your coaxial cable can deliver to it. It is an omni-directional antenna that is perfect for talking across town, for base to mobile communications, and for working DX. Although this antenna is built for the 11 meter CB band it can also be built for any amateur radio band 6 through 20 meters using the same or similar construction method. The antenna is made using sections of telescoping aluminum tubing, thick wall PVC pipe insulators and an aluminum mounting plate. A bulkhead type UHF connecter is added at the feed-point for both convenience and for grounding purposes. 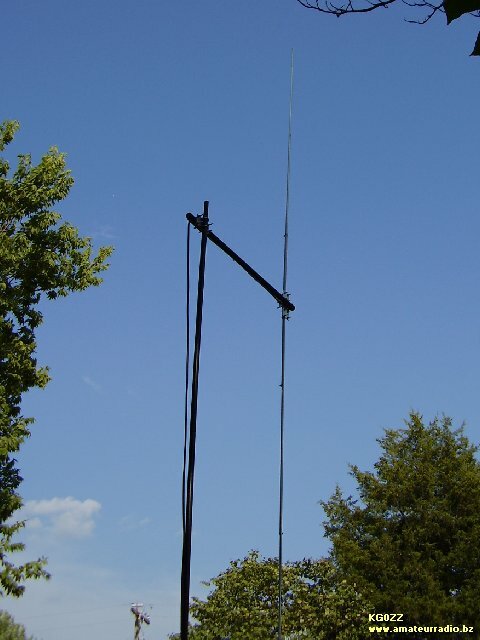 The Peg Leg Antenna is a vertical dipole antenna that has two separate and equal element halves. It is much like any other dipole except this one is designed so that at least one half of the antenna can be grounded to prevent capacitive discharge. Static electricity can build up on an ungrounded antenna and be discharged at the other end of the coaxial cable. Grounding an antenna will help to eliminate this problem. The two halves of the antenna are made using 4' lengths of .058" wall 6061-T6 aluminum tubing. I used one 4' length of 3/4" outside diameter aluminum tubing and two 4' lengths each of 5/8" & 1/2" tubing. The 3/4" tubing is cut in half into two 2' lengths to be used at the base each half of the antenna. These are then notched out at one end for clamping the sections together using hose clamps. On the opposite end of the 3/4" tube a 1/8" hole is drilled 1/2" up from the end for attaching the UHF connector leads. The leads are connected with stainless steel #6 sheet metal screws along with ring connectors and internal tooth lock washers. When attaching the leads the center coaxial lead connects to the top half of the antenna. Notches are also cut in one end of the 5/8" sections of aluminum tubing. Two pieces of thick wall 3/4" schedule 40 PVC pipe 2-3/4" long is used for insulators. These are a little larger than the aluminum tubing but are held securely in place with the u-bolts. 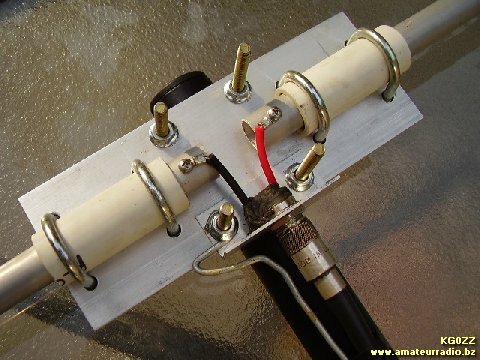 Clear vinyl tubing can be used as insulators instead of the PVC pipe if you are building a smaller version of this antenna. The mounting plate is 8" x 3" x 3/16" and cut from a piece of 3" x 3/16" aluminum flat bar. Holes are drilled for the u-bolts that hold the antenna element halves and for mounting to the boom. For the UHF connector mounting bracket I used 1" x 1/16" aluminum angle. This was made long enough so that holes could be drilled and the bracket held in place using one of the antenna-to-boom u-bolts. The length of this mounting bracket will depend on how wide your u-bolts are. The boom is a 4' length of large diameter aluminum tubing or pipe but it can also be a section of steel mast. The antenna is mounted at one end of the boom and to a mast at the other end using an additional mounting plate and u-bolts. When attaching the coaxial cable to the antenna the cable must be stretched out across the entire length of the boom. The purpose of the boom is to feed the antenna at the correct angle and to get the coaxial cable away from the antenna. Below is a seven part video detailing how I built this antenna. Part 1: The Plan & Parts (12:27). Part 5: Soldering the Leads (4:40). Part 2: Prepping the Tubing (7:03). Part 6: Final Antenna Assembly (17:50). Part 3: The Mounting Plate (5:49). Part 7: Testing the Antenna (5:03). Part 4: The UHF Connector (6:58). Try to mount the antenna as high as possible. If you can get the antenna with the boom mounted at 40' then this antenna should really talk! Avoid using a resonate length of mast such as a quarter to a half wavelength. Both the antenna and the mast are vertical and can interact with each other. Again, the coaxial cable can also interfere with the antenna so get it as far away from the antenna as possible. Attach a ground wire between the mounting plate and u-bolt nut directly under the UHF connecter and run the ground wire in the same direction as the coaxial cable. The ground wire can be run across the boom then down the mast. Run the coaxial cable out across the entire boom then down the opposite side of the mast. When testing the antenna at only 20' the two halves of the antenna came out longer than as calculated. Using 234/27.2 MHz the calculated lengths came out to be about 8' 7-1/4". After adjusting the lengths for the antenna mounted with the boom at 20' the lengths came out to be 9' long. This made each outer section of aluminum tubing 3' 6" long. I'd suggest making each half of the antenna 9' long to start with then tune the antenna by shortening an equal amount of each half of the antenna until you get an acceptable reading on your SWR meter. If you have any problems then it may be that the mast needs to be taller or that the coaxial cable is too close to the antenna. When first testing the antenna you can also move the coaxial cable around some as it hangs off the boom to see if your SWR match improves. Other problems may be caused by a short in the cable or at the feed-point connection. A bad piece of coaxial cable can also cause a problem. Aluminum tubing, 2 sections, 3/4" x .058" x 2' long. Aluminum tubing, 2 sections, 5/8" x .058" x 4' long. Aluminum tubing, 2 sections, 1/2" x .058" x 4' long. Hose clamps, 4 each, for aluminum tubing. 1-1/2" x 4' aluminum boom (or similar). U-bolts (with nuts & lock washers), 4 each, 1-1/8" x 1/4". U-bolts (with nuts & lock washers), 2 each, to fit boom. 3" x 8" x 3/16" Aluminum mounting plate. 1" x 1/16" Aluminum angle, 2-1/2" long. Thick wall 3/4" PVC pipe, 2 pieces, 2-3/4" long. #6 Stainless steel sheet metal screws, 2 each. #6 Stainless steel internal tooth lock washers, 2 each. #6 Crimp on ring connecters, 2 each. 14 Gauge solid copper wire, 2 pieces, 6" long. Additional boom-to-mast mounting plate with 4 u-bolts. Coaxial cable, mast, ground wire, ground rod, guys, etc. Copyright © 2013 KG0ZZ. All rights reserved.